Kenya is set for a major boxing event next month when East and Central Africa bantam weight women professional boxing champion Fatuma Zarika takes on American Natasha Spencer in the Super Bentam weight 10 round bouts in Nairobi. The matches organized by renowned promoter Caleb Kuya and the burner Osaga promotions will be held on 30th of November at the Stanley Hotel and will have three title bouts under the World International Boxing Association and will involve boxers from; Kenya, South Africa and USA. 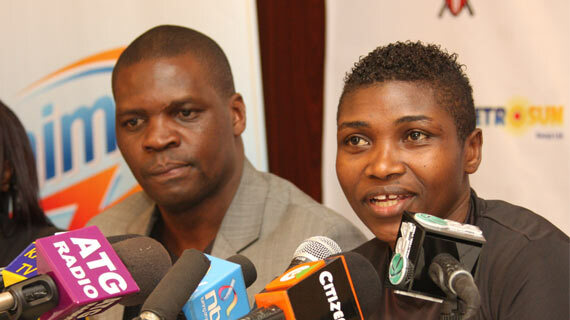 "We are looking forward to giving Kenyan fans one of the best boxing matches in many years. This is in efforts to rekindle the reputation of the sport in the nation." said Kuya. This will be the first major fight for Kuya since his License was reinstated. Kuya was apparently suspended and his license revoked by KPBC two years ago following sharp disagreements between him and boxers under his stable with most boxers complaining about lack of honoring pledges on the promoter’s side. Kuya called upon well wishers to come in large numbers and help raise 2.3m towards supporting the organization of the fights. Also speaking on Friday in Nairobi, Fatuma Zarika who on her comeback edged out Farida Namugerwa from Uganda on points in a fight staged at Nairobi City Hall in May says she is looking forward to facing her opponent. "The nation is no doubt waiting to have us fight next month. Personally it will be my major international fight and I have to continue preparing well." said the 28 year old born in Mathare. The other title match will see Kenyan Jane Kavulani take on American Tyriesha Douglas in the feather weight 10 rounds. Charity Mukami will play Julie Tshabalala of South Africa in the super Welter weight 10 round. The other Kenyan boxers expected to feature include Evelyn Odero in the light Welter weight six round ,Hellen Atieno in the feather weight six round, Judy Wanguthi and Curtis Obungu. Arrival of the foreign boxers will be on November 25th with weight checking set for four days later a day before the fights. Daima milk on Friday committed ksh 400,000 towards the support of the event.